Velvet Paw Creations: "Frames of Your Life" card for Lost Coast Designs DT! 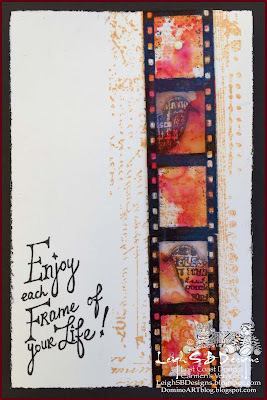 "Frames of Your Life" card for Lost Coast Designs DT! Here's a card I made for Lost Coast Portal to Creativitys mid-month Challenge #25 reminder for Use Something See Through! I went with using a piece of clear acetate recycled from a package, in this case it was an embossing folder's case and I wanted the film strip on the front to be slightly crooked and the overall look to be distressed so I made this card grungy, non-perfect yet beautiful at the same time...just like Life. The sentiment is of my own invention and hand written with a black Micron pen. 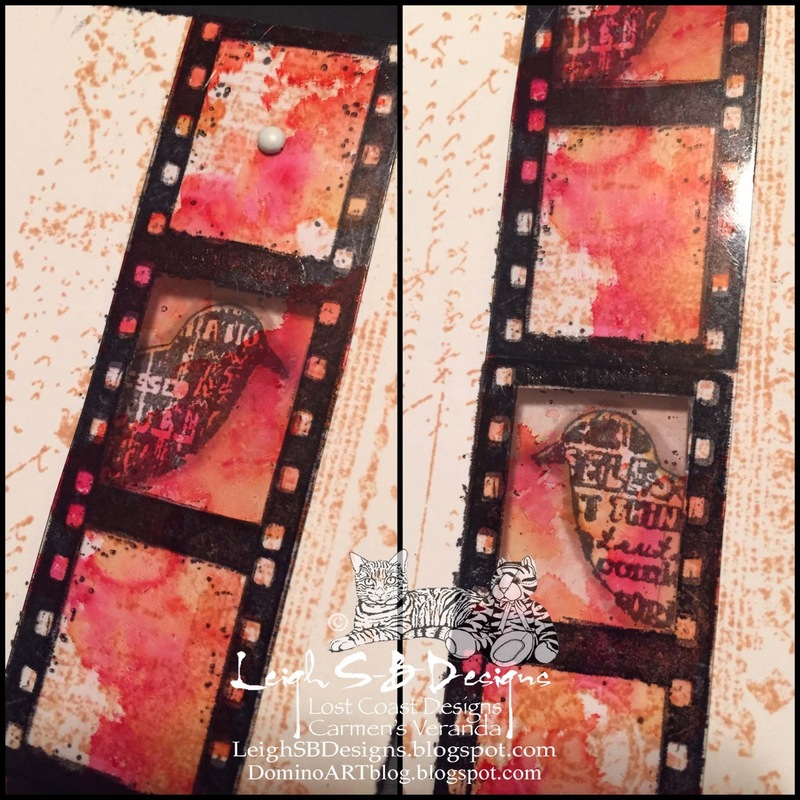 I used Lost Coast Designs' small Film Strip, 3 mini Birds and the 2" Grunge Border. I stamped the Grunge border on the front of the card with Tea Dye Distress Ink and over stamped the film strip in Onyx Black Versafine ink just slighly crooked...I wasn't going for perfect. 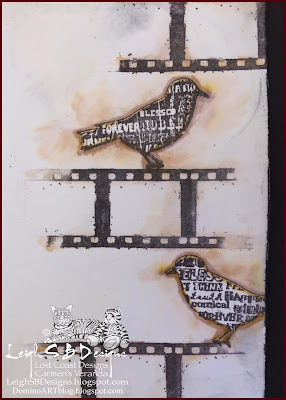 I cut out 2 of the openings with an Xacto knife, made some registration marks with a pencil on the inside and stamped the birds inside the card so their heads showed in the film strip frames. I stamped the film strip inside the card as well and applied Tea Dye and Black Soot DI and a Tea Dye Distress Marker to create the grunged up watercolour effect. 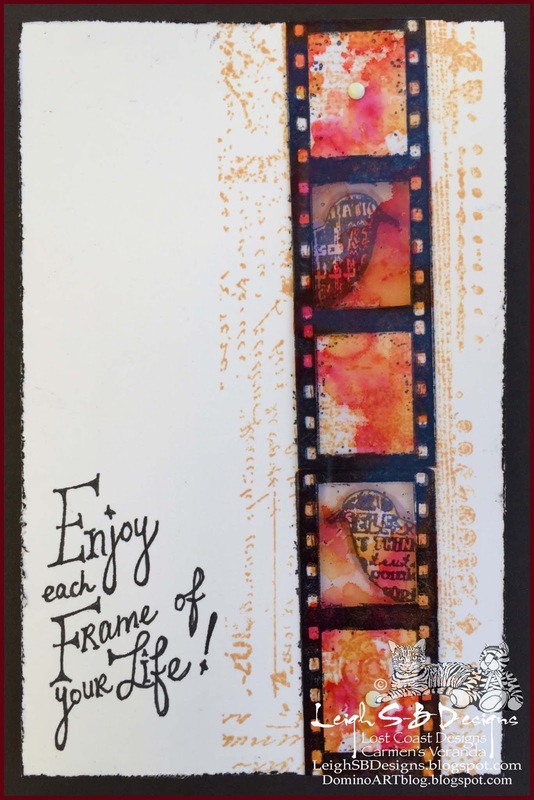 I stamped the film strip onto the acetate with black StazOn ink and applied Alcohol Inks to the other side in shades of red and yellow for the fun splash of colour. I trimmed the acetate film strip and adhered it to the front of the card with 2 tiny white brads. I finished off by distressing the edges of the card and applied Black Soot DI. Our challenges start on the first Monday of every month so stop by Lost Coast Portal to Creativity July 4th for our next challenge and I hope you'll stay to play with us!